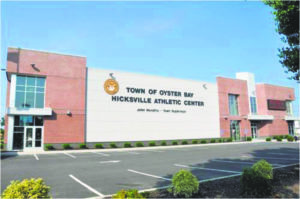 The historic G. Hunter Jones mural, prominently featured in Sears in Hicksville since the 1960s, recently found a new home at the Town of Oyster Bay Hicksville Athletic Center on South Broadway. 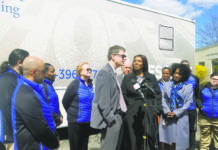 After the closure of Sears in April, residents feared what the future of the mural would hold, but much to the relief of those concerned, the mural was removed, preserved and sent for restoration with the Philadelphia-based Materials Conservation. Oyster Bay Town Supervisor Joseph Saladino, Councilwoman Michele Johnson, Councilman Louis Imbroto, State Assemblyman Michael Montesano and County Legislator Rose Marie Walker joined with Executive Director of the Hicksville Chamber of Commerce Lionel Chitty, Larry Rose of Seritage, the future developer of the former Sears property, and other members of the community to celebrate the return of the mural to Hicksville. 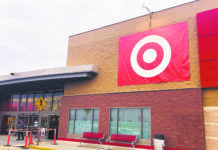 Earlier this year, Seritage Growth Properties, future developer of the former Sears property, funded a feasibility study to determine how the mural can best be saved and preserved. The famous Sears mural was moved to the Hicksville Athletic Center. 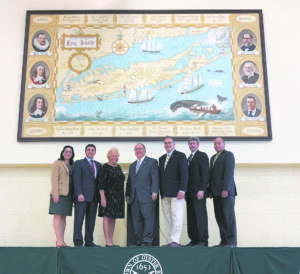 The oil-painted mural depicts a historical map of Long Island along with portraits of famous residents, such as Walt Whitman, Henry Hudson, John Roebling, Peter Stuyvesant, John Underhill and Theodore Roosevelt. The work also includes a detailed map of Long Island and a timeline of importantly significant dates and events. G. Hunter Jones, a prolific Manhattan-based artist, spent nearly two decades traveling the nation to localize the sprawling department stores with his oil paintings.